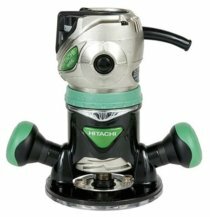 Hitachi router models include a fixed base version, a combo kit with both fixed and plunge bases, and two big plunge routers best suited for use in a table. They get good reviews overall, and two models have garnered a "Best Value Award" from Fine Woodworking Magazine in recent years. Hitachi's woodworking routers are good quality tools that can be had for less money than most other tools in their class. Hitachi has been manufacturing power tools for the professional user since 1948, and since then has produced many millions of power tools. They have built a reputation for quality and innovation, with many "firsts" in the power tool industry. All of their woodworking routers are backed by a five year warranty. The Hitachi M12VC is the entry level Hitachi router. It has a fixed base and a 2-1/4 HP variable speed motor (8,000 - 24,000 RPM). The motor features soft-start technology and an electronic speed control that maintains the set speed when under load. It is also one of the quietest woodworking routers out there. 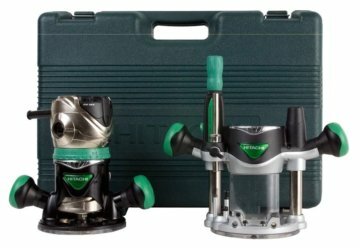 The Hitachi M12VC comes with both 1/4" and 1/2" collets, a template guide adapter, centering gauge, and the necessary wrenches. This Hitachi model seems to be quite popular for use in a CNC machine, as noted in a number of reviews. Amazon customers give it an average of 4.2 out of 5 stars, with over 50 reviews (click to view) at the moment. The Hitachi M12VC fares slightly better on the Lowes website, with 4.6 stars from 14 reviews. The comment you see over and over again in the Hitachi router reviews is that the M12VC is quiet and has plenty of power. Several reviewers say they own multiple routers of different brands, and this is their favorite. A number of folks actually own more than one Hitachi M12VC. An owner on the WoodworkingTalk forum says that, "This model is one of my favorites for hand use because it's light, quiet, and accurate, but it also has variable speed and is powerful enough for table use (11 amps). Variable speed is a must for table use. I've owned 8 routers and have kept this one over several other good routers." Complaints for this model are that the on/off switch is hard to reach when holding the tool, and several people do not like the square nuts that are used on the collet. The supplied wrenches are inexpensive stamped steel. A couple of owners had issues with the collets loosening during use and letting the bit fall out. One of the more common complaints on the Hitachi M12VC is that the bits get stuck in the collet, requiring a tap from a mallet to break free. A couple of owners solved this problem by keeping the collet clean and using WD40 on it occasionally. The Hitachi KM12VC combo kit appears to be the most popular Hitachi router, with good reason. A combo kit is almost like having two woodworking routers, a fixed base router and a plunge router. Combo kits like this are very popular these days, and a number of manufacturers offer them, including Milwaukee, Bosch, Porter Cable, Makita, and DeWalt. The Hitachi KM12VC combo kit shares the same specs as the fixed base model above: an ultra-quiet 2-1/4 HP motor with variable speed, soft start, and electronic speed control. The plunge router base adds a fine depth adjustment knob, too. The Hitachi KM12VC comes with both 1/4" and 1/2" collets, seven template guides, a centering gauge, and the necessary wrenches, plus an extra sub-base plate and a case. This model gets the best overall reviews of all the Hitachi woodworking routers. Amazon currently has over 70 reviews averaging 4.3 out of 5 stars, with owners saying it is quiet and has plenty of power. The Hitachi KM12VC won the "Best Value Award" in Fine Woodworking Magazine's 2010 Tool Guide comparison test of 2-1/4 HP combo kits. The Sawmill Creek forum has several owners that say they love it. One owner on the RouterForums website said, "... I am extremely pleased with the Hitachi KM12VC. It has a smooth and precise feel and adjustments are easy to accomplish. The sub base has a feature that makes sure it located in the same place on the router base every time you mount it." Later in the same thread he posts, "... Now that I have had the Hitachi router to use for a while I like it even more! ...I find I go out of my way to use this router over the others I own so much so that I have decided to buy a second one." One complaint that seems to pop up repeatedly on these Hitachi router reviews is that the bit gets stuck and you have to tap it with a mallet to break it free, just like with the fixed base model above. A few people commented that the plunge action is stiff when new, and several folks found the instructions lacking, especially for the plunge base. A review on About.com said that the fixed base was a bit narrow, and it seemed like the unit was a little unbalanced due to the motor being higher than on comparable routers. The Router Book: A Complete Guide to the Machine and its Accessories by Pat Warner. The next step up the Hitachi router ladder is the Hitachi M12SA2. It is a 3-1/4 HP, single speed (22,000 RPM) plunge router. It has a dual-purpose knob that is used for both coarse and fine plunge depth adjustments, and the collet protrudes slightly above the table for easier bit changes when mounted in a table. It also has a spindle lock for single-wrench bit changes. The M12SA2 comes with a number of accessories, including a straight guide, centering gauge, template guide adapter, guide bar, both 1/4" and 1/2" collets, and all the necessary wrenches. It has a 2-9/16" maximum plunge depth. I could not find any reviews of this particular Hitachi router, and frankly, I am not sure what need Hitachi is trying to fill with the M12SA2. One of the advantages of having 3-1/4 HP is that you can use big bits, but the single speed of 22,000 RPM is too fast for wide bits. Maybe in a production environment it has a use for cutting deep, relatively narrow grooves, but the next step up has the versatility of multiple speeds and costs very little more. Which brings us to the top of the heap with the Hitachi M12V2. This one has the same 3-1/4 HP rating as the M12SA2 above, but adds a variable speed feature (8,000 - 22,000 RPM), a soft start, and constant speed control to maintain bit speed under load. Otherwise, it has all the same features M12SA2: a spindle lock, coarse and fine depth adjustment, and the collet that protrudes above the table for easier bit changes when mounted. The Hitachi M12V2 comes with all the same accessories listed above for the M12SA2, also. The Hitachi M12V2 gets good reviews, although not as good as the 2-1/4 HP Hitachi routers. Amazon reviews average 3.7 out of 5 stars with 58 total reviews at the moment, but several poor reviews listed issues with Amazon and not the tool itself, unfairly bringing the average down a little bit. A disconcerting number of Amazon purchasers somehow received tools that had been used and returned and/or had packaging issues, bringing the rating down even more. Everybody seems to agree that the M12V2 has plenty of power, though. The 2011 Fine Woodworking Magazine Tool Guide gave the Hitachi M12V2 their Best Value Award in a comparison of heavy-duty plunge routers. Their summary of the M12V2: "This model plunges smoothly and handles very well. A good edge guide, a proprietary guide bushing, and an adapter for Porter Cable bushings are standard, which is great given its cost. Adjustments to plunge depth settings are easy, and switching between macro and micro adjustments is simple." They also add that, "... On the down side, the router's dust collection is ineffective (as it is on most of the other routers). The spindle lock worked fine, but the wrench is stamped from thin steel and uncomfortable to use." The Sawmill Creek forum has a few fans of the Hitachi M12V2. One comment is, "... I have that router in my table and it has done everything I have asked of it. A real workhorse." Another owner says, "It is a great router. I also have one in my table and it seems bullet proof." And finally, "The Hitachi M12V2 rocks!" The only complaint that I found repeatedly was about the plastic parts in the height adjustment mechanism on the big Hitachi router. Several people had the knob break and/or had issues with the plastic threads when using it mounted in a table. This is similar to what I found in my review of the big Milwaukee router, where a few owners chimed in that you just have to keep sawdust from building up on the mechanism. Another way to prevent the problem from happening is to reach under the table and lift the router higher than needed, and then use the depth mechanism to lower it to the desired height. 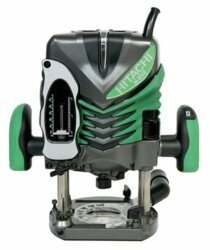 The Hitachi router models listed above (with the possible exception of the M12SA2) offer a good value on a professional quality woodworking router. You can get all the detailed specs on them at Hitachi's website. The smaller 2-1/4 HP models are quieter and less expensive than comparable models in other brands. The big M12V2 Hitachi router offers the same heavy-duty capabilities for roughly $100 less than several other brands. Most owners are happy with their Hitachi router , and that is what really matters most.